Here’s a fun geek toy, a miniature version of an industrial robot arm for your desk, the Edge Robotic Arm Kit. This fun miniature robot arm comes in the form of a kit that you build yourself, and it features 5 individual motors and 5 axes of movement. The Edge Robotic Arm Kit is controlled via a wired remote, it features a wrist motion of 120 degrees and an elbow range of 300 degrees with a base rotation of 270 degrees, here’s a video of it in action. 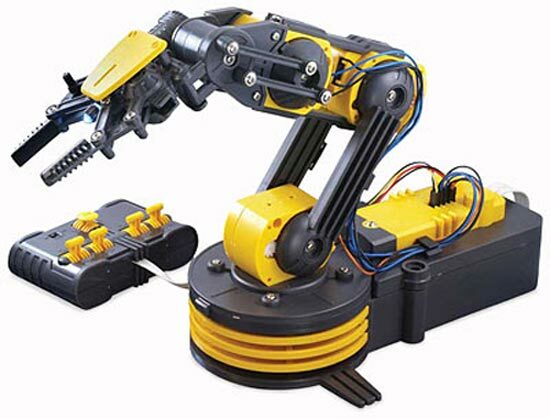 The Edge Robotic Arm Kit is available for $49.99 from Think Geek .